We have two powerful edit systems. final Cut Pro and a Media 100 XS system. Each system has over 2 terebytes of hard drive space – good enough for about 50 hours of video each. 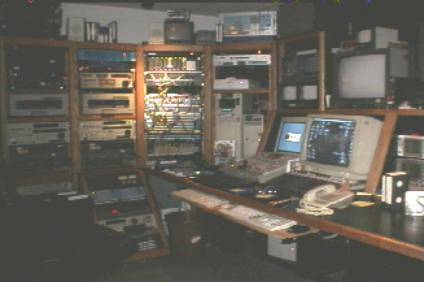 For our linear (tape to tape) system we use the Videomedia OZ edit system. It’s a A-B-C-D Roll component system with the Alladin special 3D effects box integrated into the system. That means you can record on 4 separate cameras in the field and roll all of them at once in post. It also makes it very easy to switch cameras on locatoin, then go in afterward and ‘clean-up’ any bad switches that were made. This makes a for a very powerful combination for linear editing. We also have the After Effects program with many plug-in programs for a variety of special effects – including “Cinelook” – a program that duplicates film grain – even film damage onto video footage. This is the same program that you see in many of the opening title sequences in series like “ER”. Most of all, we have the personnel that can add the creative touches to any project. Ask for our latest demo reel.